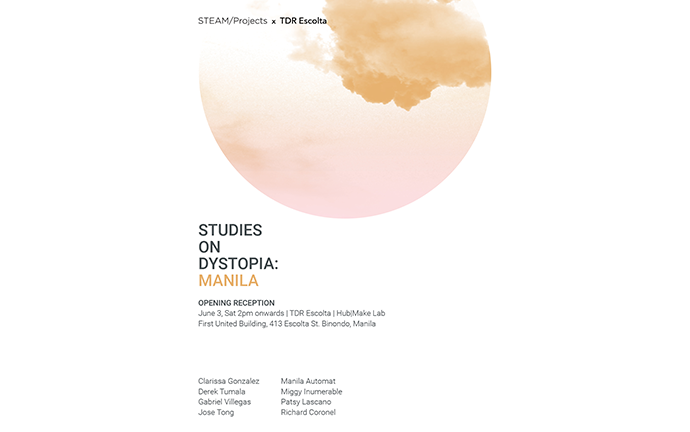 As its third offering, STEAM/Projects presents Studies on Dystopia: Manila featuring eight artists from different backgrounds whose works for the exhibition seek to either decode, describe, reassess, reconfigure or resolve the experiences embedded in the dystopian values of Megalopolis Manila. The participating artists’ respective approximations of these experiences range from the deeply-rooted infections to the multifaceted superficial scabs of the metropolis’ wound. 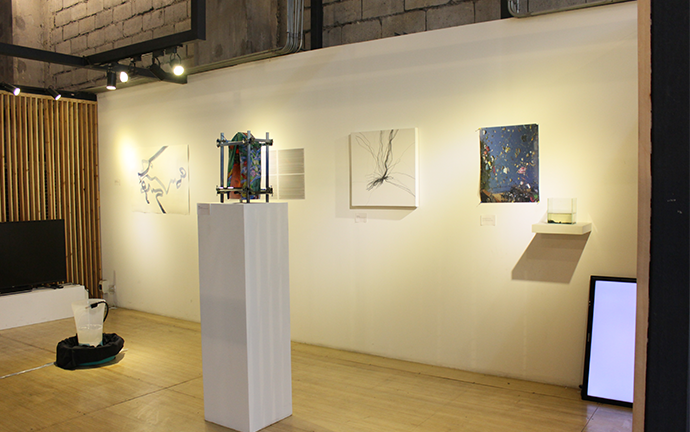 STEAM/Projects is a series of art shows which focuses on art-science affinities through the emerging trajectory of the intersection of art with science, technology, engineering, architecture and mathematics (STEAM). The artists create works using traditional methods and new technologies such as digital technology and open knowledge sources. The new emphasis on the shifts of ways of creating took on metaphorical as well as material importance as the artists take advantage of advances in digital technology which has democratized creation to unimaginable heights. The convergence of art with STEAM presents an alternative window to scientific possibilities. With the premise that art has no definitive way of working, no prescribed approach, it opens up possibilities and develop new shifts and possibilities for science and technology to enrich itself. Art encourages to tap the unexplored facets of the hard sciences under the lens without expecting exactness or accuracy. Because art is highly philosophical, it has the potential to address questions and concerns beyond mere function or utility which is characteristic of science and technology. Art then becomes the human element. This is the principle that guide the artists of Studies on Dystopia: Manila as they put the metro as the focal point of their works. The capital region provides a fecund ground for inspiration. The multifarious faces of Manila give us shadows of its past and possible future. Living in Manila, with all her polarized horrors and delights, is as far from easy as trying to encapsulate the experience. Her perplexed inhabitants could only entrench themselves in this little world with a feel for the glittery pomps sans consciousness. It is easy to be lured into interpreting Manila with the sensibility for the cheap, gritty, kitschy, campy heavy metal revelry that it is. We sometimes forget that the eclectic metropolis and her polymorphic transformations are the continuing results of several painful memories gradually being diluted throughout time by a culture of impunity and revisionism, and of resilience and callousness. From her sublimation from being a glorious city caused by a war that was not hers to the benevolent assimilation of her culture to the rapacious plunder of her neighbor territories’ natural resources to the unwelcome brand of predatory foster parenting of her new white gods; she was an unwilling whore of imperialist masters. It is a hackneyed, collective trans-class wound that has not quite healed. Designer Mica Agregado a.k.a. Manila Automat used unconventional media consisting of conduit pipes, LED, tarpaulin and a plant for her sculpture entitled Plante. Manila Automat’s design borders on plastic-ridden, brick-heavy, pattern-frenzied kitsch vivid during the days of early modernity; through the achievement of ambiguity between class and chintz; corporations and singularity; and mass production and specialty. Time-based media artist Richard Coronel is mounting the single-channel video installation Realpolitik Urban Design: A Walkthrough featuring a collage video that is part of a semi-autobiographical series about his quest for sanity. Coronel studied Communication at De La Salle University Dasmarinas; and video and motion picture production at University of the Philippines Film Institute and Asia Pacific Film Institute. He has been self-producing and exhibiting time-based works since 2012. His works have been shown in the Netherlands, Croatia and Japan. Making videos has been helping him combat his nihilistic tendencies and technophobia. Multimedia artist and designer Clarissa Gonzalez‘s video installation entitled Tempest creates illusions and trajectories of dystopic quality. It depicts Manila as a hurricane, a spinning conglomeration of grit and light; constantly evolving through a mix of destruction and creation. Gonzales is a founding member of Mvltiverse, a digital practice collective that explores the new forms of the moving image. In Bang, artist Miguel Lope Inumerable shows prints from a computer program that explores the idea of how communication and miscommunication hinders or advances progress. Inumerable works in different mediums but mostly exploring the concept of drawing through traditional drawing and expanded drawing using sculpture, installation and new media. He also explores the use of science and technology particularly computer programming in his practice of art making. After working as a computer programmer for a few years, he took part in Metafora’s International Workshop for Studio Arts in Barcelona, Spain in 2013. He also took part in different art residency programs like Takt Kunstprojektraum, Berlin in 2013 and Shangyuan Art Museum, Beijing in 2014. He currently lives and works in Manila. He is also a member of 98B COLLABoratory based in Escolta, Manila. User interface designer and illustrator Patricia Lascano is interested in exploring the boundaries of visual art with technology. Her work Daily Sprawl is a laser engraving on plywood, a data visualization on commute direction searches from Sakay.ph. Starting with a design background and ending up in the tech field, Lascano hopes to meld her two passions: traditional painting and creative coding, into new cohesive forms of art. She studied at Ateneo de Manila University with a degree in Information Design and a minor in Interactive Multimedia. Currently, she designs and codes at By Implication and illustrates for children’s books from time to time. Multimedia artist and architect Jose Tong a.k.a. A.I. Hoseki presents Coordinates of Liberty, a 3D-printed plastic sculpture. His works explore consciousness, identity and phenomenological qualia. Through drawings, architectural works and site-specific installations which are made through a generative algorithm-based process, he investigates the ambiguity and contradictions of reality, emergent technologies, social constructs and their relationship with the human condition. 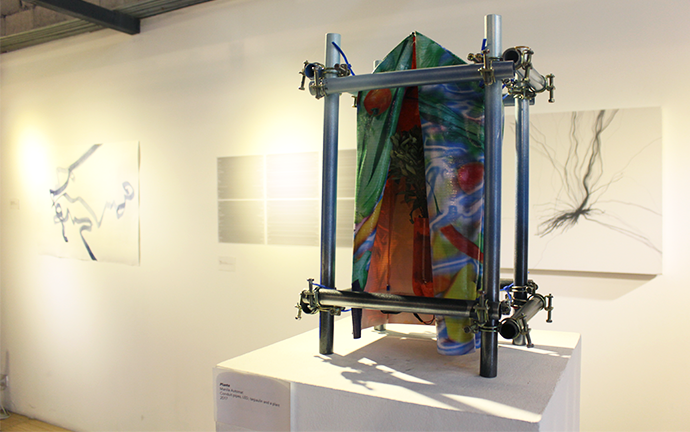 Ateneo Art Awards 2015 finalist Derek Tumala‘s work Trash Paradise is a set of apocalyptic activewear and accessories intended to survive the worst catastrophes using everyday objects and electronics. He created things from daily objects and transformed it into a “useful” gear with DIY electronics, suggesting possible configurations of a survival kit. 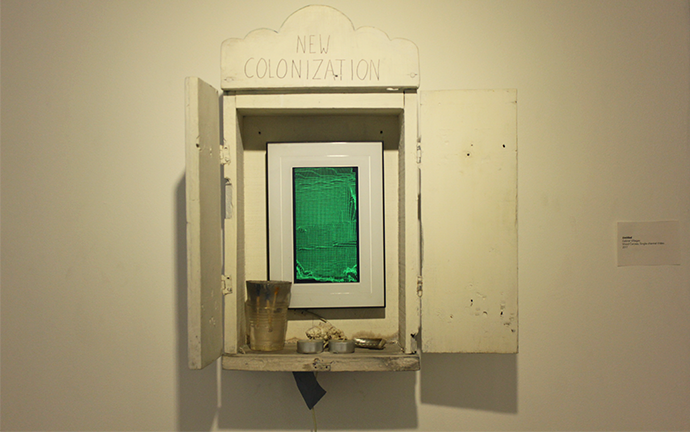 Tumala deviates his art practice by creating works that transcends the intangible. Taking cues from futurism, science and technology, his visual approaches and conceptual derivatives convey an account of exploration, a tangible experience and a sensory reflection. Among his noted participations are: Art Basel Hong Kong 2017, Formosa Art Fair Taipei 2016, and Wei-Ling Gallery Malaysia. 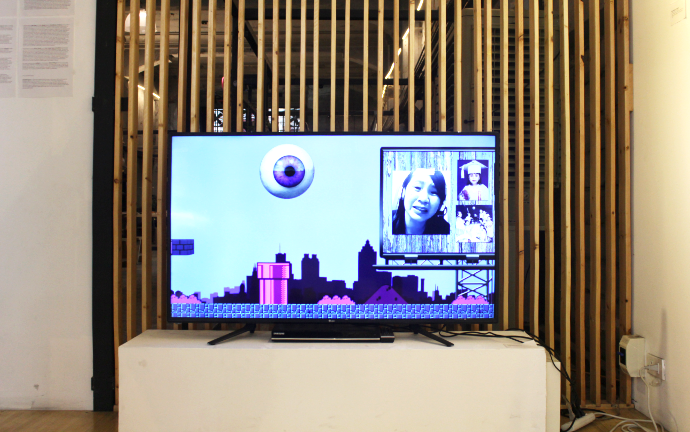 He is also the founder of multimedia group Mvltiverse and art-tech collective STEAM/Projects, both based in Manila. 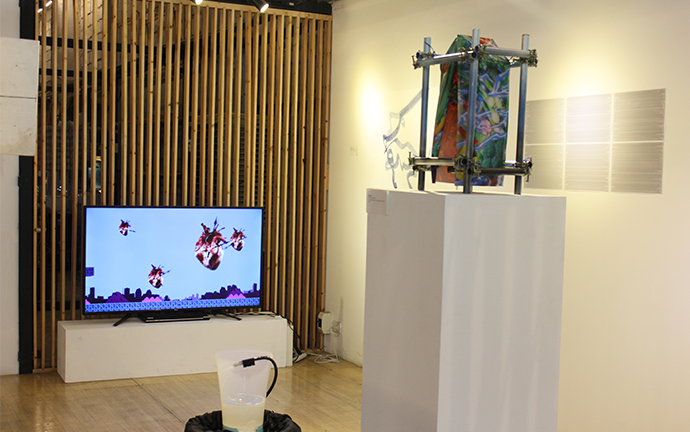 The aural piece Echo Chamber by artist-designer Gabriel Villegas features clips from conversations and interviews of different people in Escolta, Manila about community. 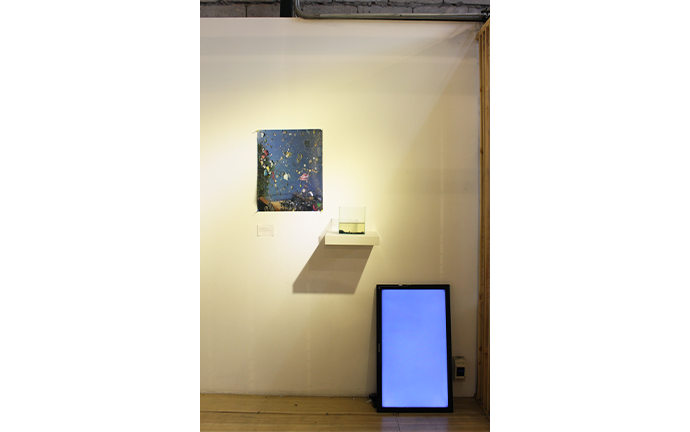 Villegas has participated in several exhibitions: domestiCITY (2013), On/Line (2015), and Zine Zone (2015). He is currently operations director of 98B COLLABoratory and Hub | Make Lab.